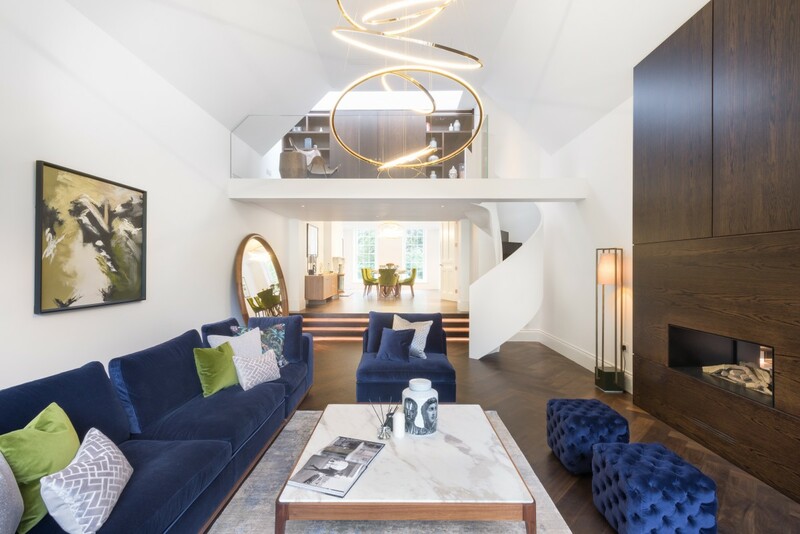 The latest project from Design by UBER saw a complete turnkey interior design solution for a first floor apartment which is housed within an attractive Victorian building. 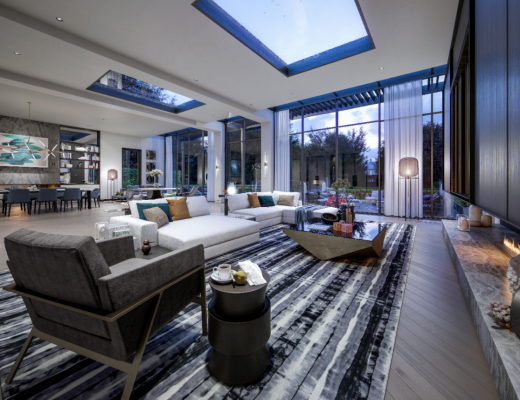 A highly acclaimed interior design agency, Design by UBER is renowned for delivering exceptional design solutions which are executed with creative flair, passion and enthusiasm. In this case, they were commissioned to transform the newly constructed shell of a three bedroom apartment into a fully designed, specified and furnished home which was ready to move in to. The brief was to create a contemporary space which was also sympathetic to the property’s rich heritage. The client wanted the apartment to feel luxurious and to have easily identifiable masculine touches. Design by UBER’s involvement in the project began when the redevelopment of the building into an apartment complex was still in the construction phase. They liased with the architects to ensure that any design perfectly complemented the character of the building. One of the first steps was to work on a detailed space plan, ascertaining the flow from one space to the next. 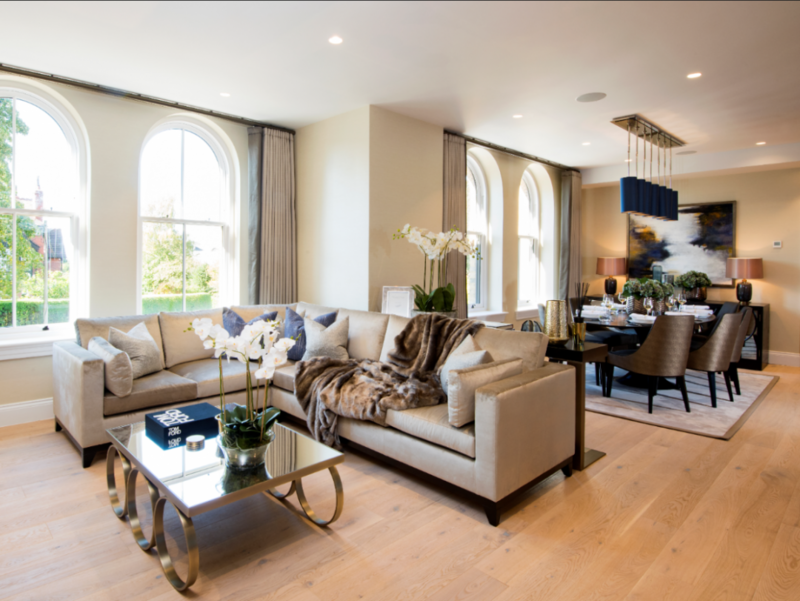 The main living space is open plan and, with light flooding in from four arched period windows, it ensured the space could be designed in rich, luxurious tones without closing it in. The dining and living spaces were delineated with the strategic placement of a stylish console table in a high gloss finish. In the dining area an ebonised oak and dark bronze oval table forms the focal point and the colour scheme in subtle shades of bronze is uncompromisingly sophisticated. 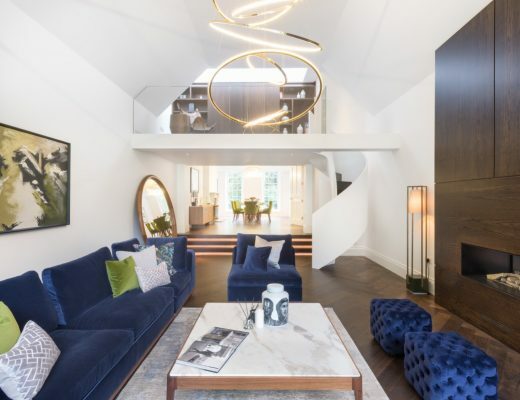 Accents of blue in the accessories, artwork and drop pendant lights offer depth and a richness of tone. Raised and lowered ceiling and floor details throughout the apartment have been used to neatly define spaces. From the dining space two steps lead down to the kitchen which is styled with sleek contemporary units. To one side of the living room steps lead down to a cinema room which is designed in dark and atmospheric tones of deep purple. 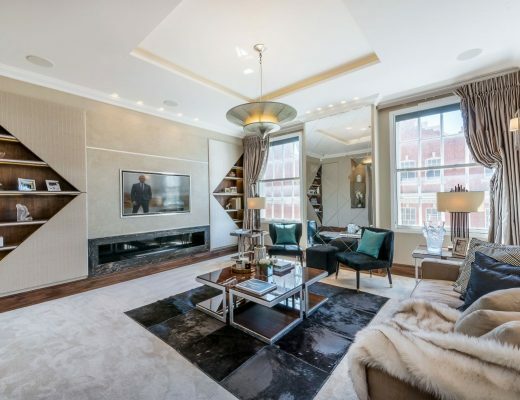 A variety of inviting textures have been layered to create a fully immersive experience and every last detail in this room speaks of luxury including the spectacular three sided floating chimney. Working with older buildings invariably throws up challenges which require a pragmatic approach to design. The master bedroom of this apartment houses the boiler and water pipes. Bespoke soundproof cabinetry was crafted to conceal them from sight. Similarly, in the master dressing room a mirrored panel conceals a secret door to the study – an essential yet discreet fire exit. The master bedroom is styled in neutral tones to create a calm and sophisticated feel. The use of dark stained wood and accessories in accents of rich purple form a dramatic contrast to the cream tones which underpin the design. The elegant scheme used in the bedroom flows effortless down into the dressing room which is positioned on a slightly lower level. The two guest bedrooms were designed with a similar air of sophistication. The first is designed in tones of silver and blue, whilst the second dazzles with hints of burnt orange. Completing the journey through the apartment, the client’s study, fitted with bespoke made cabinetry and a desk crafted from aged bronze, is a masterclass is understated elegance. With meticulous attention to detail, the Design by UBER team created a scheme that was sympathetic to the architectural style of the building whilst adhering to every element of the client brief, transforming a construction site into an exquisitely styled boutique apartment. 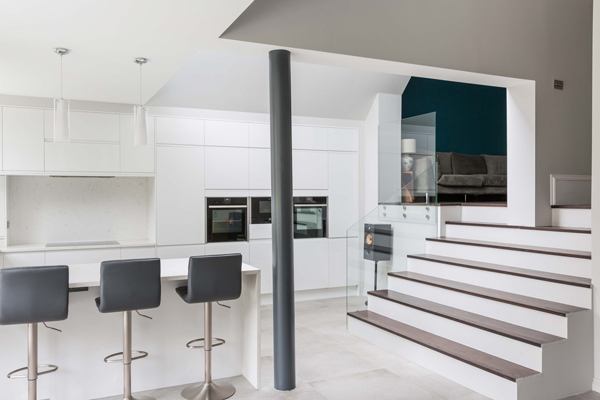 'Manor'-Style Edwardian Five-Bedroom House Completely Refurbished to Meet Contemporary Demands.